Egyptian army claims they arrested Hamas terrorist planning to plant car bomb near security target; Hamas denies allegations. The Egyptian Army announced Wednesday that it had apprehended a Hamas terrorist in the northern Sinai Desert, Al-Arabiya reports. The terrorist was named as Jumaa Khamis Mohammed Brayha, who claimed to stem from a powerful family in Hamas's ranks. During interrogation, according to the Egyptian army, the young man admitted that he was intending to blow up a Mercedes parked near a crucial security target. Hamas has denied that the detainee was among its ranks and says his name is not even included in the register of residents of the Gaza Strip. Relations between Egypt and Hamas have deteriorated, after the ouster of terrorist faction Muslim Brotherhood from power via a military coup in July 2013. The Egyptian government officially designated the Muslim Brotherhood as a terrorist organization earlier Wednesday, after Tuesday's deadly attack on a security building in the city of Mansoura killed 14 people and wounded more than 100 others. 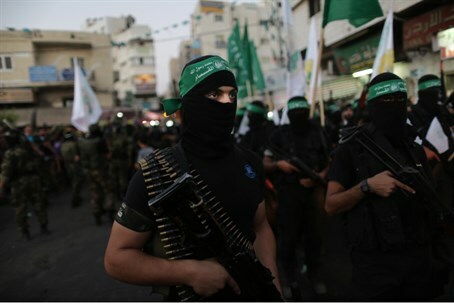 The decision is bound to enrage Hamas officials, as reports indicate close ties between the two groups. Recently, Egypt accused the terror organization of being involved in inciting terror on their soil via the Brotherhood; Hamas has denied the allegations. Hamas has also been reeling from a months-long siege on Gaza - not from Israel, as it has insisted to the media, but from Egypt. Egypt has been cracking down on terror tunnels and supply lines to the territory, according to reports. The siege has led to shortages in electricity, food, and other resources.